Three smart ways to exit a trade. Do you stay with your profitable trades as long as possible hoping for the trend to continue to make your profits even larger? Do you tense up when you have to exit a profitable trade? Where to exit is more important than where to enter, but the majority of traders in my experience don’t pay enough attention to exits as they should. Hawkeye Traders has not only developed precise entry methods, but also unique and well defined exit strategies. 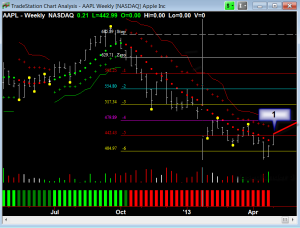 Chart 1: $AAPL weekly chart showing ATR Levels management rules. 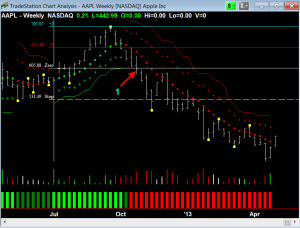 Using the Hawkeye Levels ATR on weekly stocks are phenomenal. Here are the indicator settings used for Chart 1: set the look back period to 14 and the ATR profit and stop factor to 1.5. The rules are that once the bar has closed above (if long) or below (if short) any level, the exit is a close, NOT TOUCH, of the previous level, or a touch of 2 levels back. This covers sudden reversals, so as Chart 1 illustrates, there was no time following a close below any level where there was a corresponding close above the previous level or a touch of 2 levels back. But now at the point labeled “1”, we have price trying to close above level 5, after closing below level 6… if at the end of this week it does close above level 5, the exit would have taken 5 ATR out of the market. 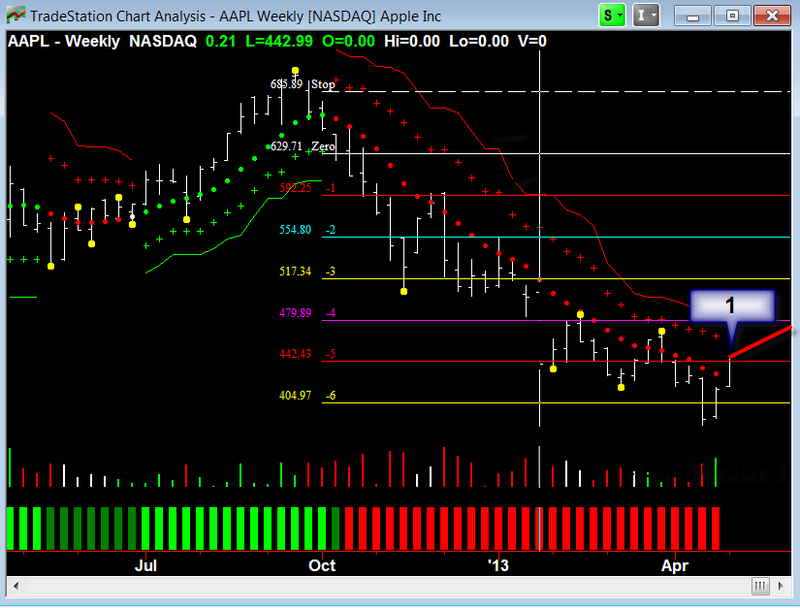 Chart 2: $AAPL weekly chart showing Levels ATR management rules. 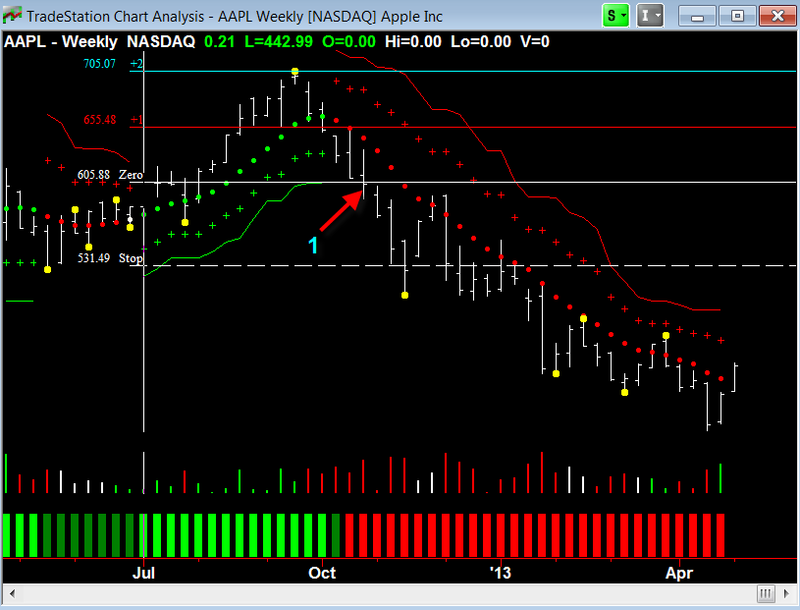 In Chart 2, I show a “losing” trade… but it demonstrates 2 methods to exit. The first exit method you can see at the point labeled “1”, where there is a close under the zero line (the entry point) after previously closing above level 1. The second exit method is the Hawkeye stop… you could have exited the trade when price closed below the “+” mark 2 bars back from point 1. But please note it was nearly a scratch trade… the Hawkeye methodology protected you at either exit point you could have selected. Chart 3: Intraday $ES tick chart showing Hawkeye Levels ATR management. 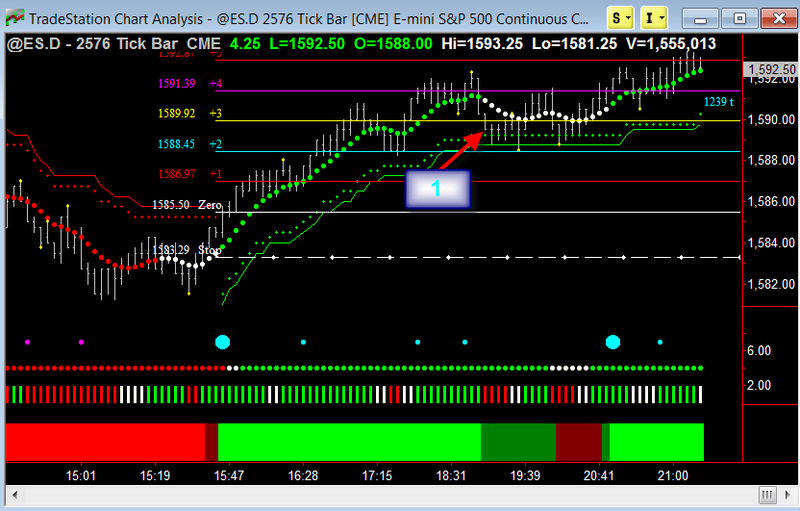 For intraday $ES trading (Chart 3), I set my Levels ATR to a period of 14 and a profit/stop factor of 1.25. See how this enabled you to take 3 ATRs from this move, as it closed above level 4, then closed below level 3, as shown at the point labeled “1” Chart 3. 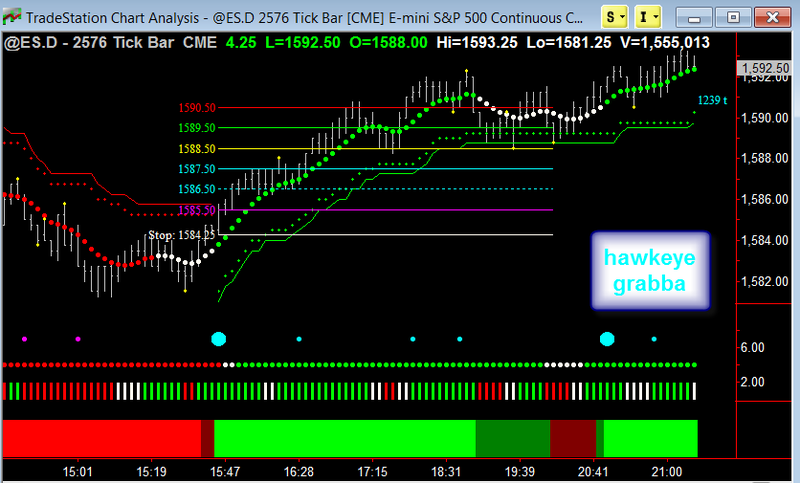 Chart 4: $ES intraday tick chart using the Hawkeye Grabba trade management rules. Using the Hawkeye Grabba allows you to set the levels at fixed price points. For example, say you want levels at every 1 point on the $ES (Chart 4)… so the Grabba settings are 4 ticks ($ES moves in .25 so 4 = 1 full point), and I set the stop multiplier to 1.25 (exactly the same rules as Levels ATR). To exit, follow the same exit rules described for the Levels ATR, or exit at predetermined profit levels as your trading plan dictates. Like the Levels ATR, the Grabba graphically shows you profit targets and exit levels for your specific exit strategy. While there is no perfect exit strategy, the Hawkeye Method enables you to exit in strength and reduce the risk that the trade will turn against you if you are in a winning position. Catch the bigger part of the trend with the Hawkeye Levels ATR, or the Hawkeye Grabba! Can you please explain the reasoning behind the different levels you are using with the Levels ATR indicator? I am using the values recommended in the manual of 1 for profit levels and 1.5 for the stop. Do you set higher profit targets based on the behaviour of particular markets, or your own experience? Previous PostPrevious Trade of the Week – Understanding Roadkill, a Low Risk Entry.